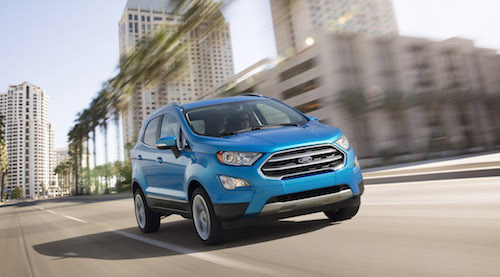 Our new Ford inventory now includes the all-new Ford EcoSport near Palm Springs, CA. This new subcompact SUV is packed with advanced technology and offers enhanced connectivity with an embedded 4G LTE modem with Wi-Fi hotspot. The EcoSport is equipped with Intelligent Four-Wheel Drive for off-road adventures and is powered by Ford’s award winnng 1.0-liter EcoBoost® engine. Convenient and affordable Ford financing and leasing is available through our finance department. Our finance experts will explain the benefits of buying or leasing a new Ford and will help you find factory incentives for our best deals on a new Ford EcoSport near you. If you are shopping for a versatile and efficient new vehicle, we invite you to stop by and meet the new Ford EcoSport near Palm Springs, California at the I-10 Automall.